Arbor Rangers ™ Online Store! General News from Arbor Rangers. Announcements, Events, Activities etc. What is PHOTOSYNTHESIS? Well… besides being a long word that you might think is one of those fancy words used in a science-fiction story, photosynthesis is actually the term used in real science to depict the amazing chemical process of how plants make their own energy. Where does a tree get its energy? Through the use of its leaves, a tree is able to manufacture its own energy through this process called photosynthesis. 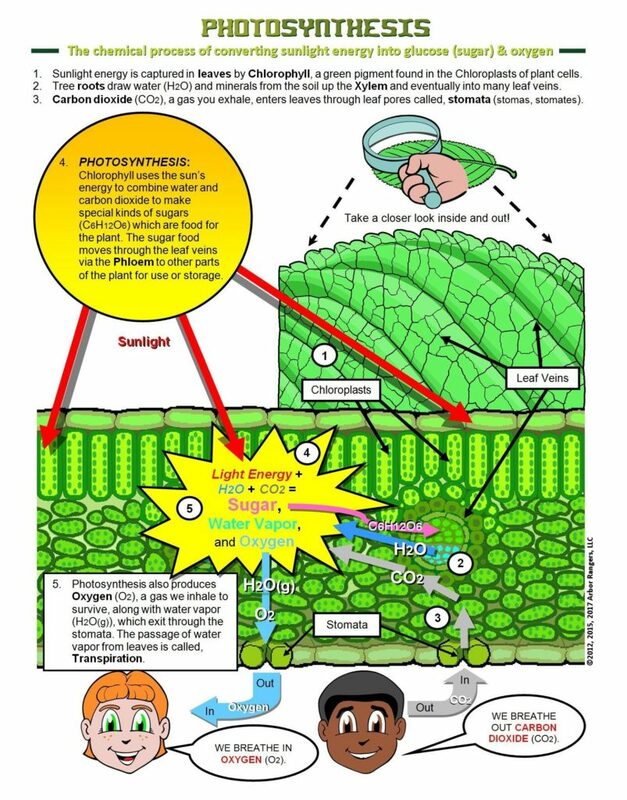 Here is a diagram of how sunlight energy is absorbed by chlorophyll combined with water and carbon dioxide are converted into sugar (also known as glucose). This sugar serves as energy food for a tree; some is constantly being used to sustain the tree and a portion is stored away in its trunks for later use. Oxygen is also produced in the process and we can all appreciate the vital importance of that for all breathing life forms… including us! 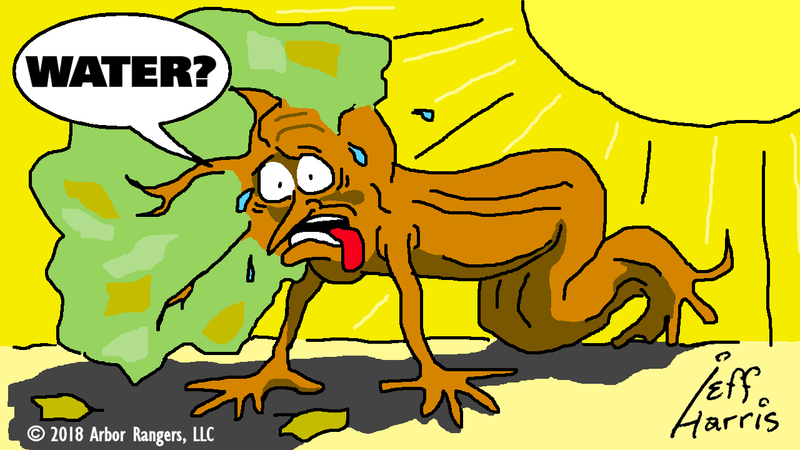 Heat & Drought Stress – Will Your Trees Survive? HEAT & DROUGHT STRESS can negatively impact your landscape plants, particularly your trees. The photo above is from an actual irrigated lawn following several heatwaves. 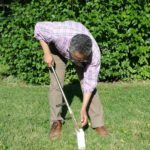 Despite receiving water from an irrigation system, the greenest areas of the lawn were those which were “protected” from sun exposure by shade trees most of the day. The rest of the lawn, on the other hand, was drying out. For many homeowners, a “weed-free” green lawn is a priority. They will invest in an in-ground irrigation system with the primary success of their lawn in mind (and their trees only as an afterthought). Perhaps, their reasoning is that ‘trees are big enough plants and can take care of themselves!‘ Unfortunately, when it comes to their existence in our urban settings, that is furthest from the truth! Just think about how much your trees are suffering! 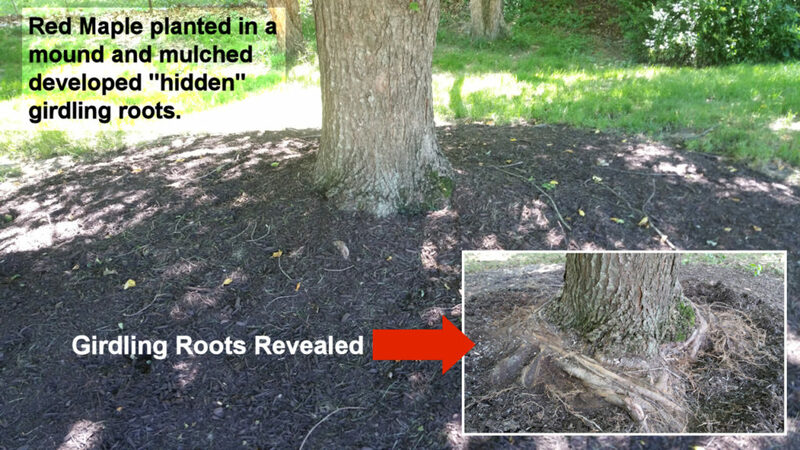 This maturing Red Maple has girdling roots that developed over the years and were hidden by years of mulching. 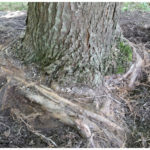 SUFFOCATION – Girdling roots can result from roots that develop as a response when oxygen availability has been reduced below necessary levels. This can happen when a plant has been planted too deeply, or by the addition of too much top soil (i.e. grade change) or from improper mulching (i.e. too deep; “volcanic” mulching), or soil compaction, etc. 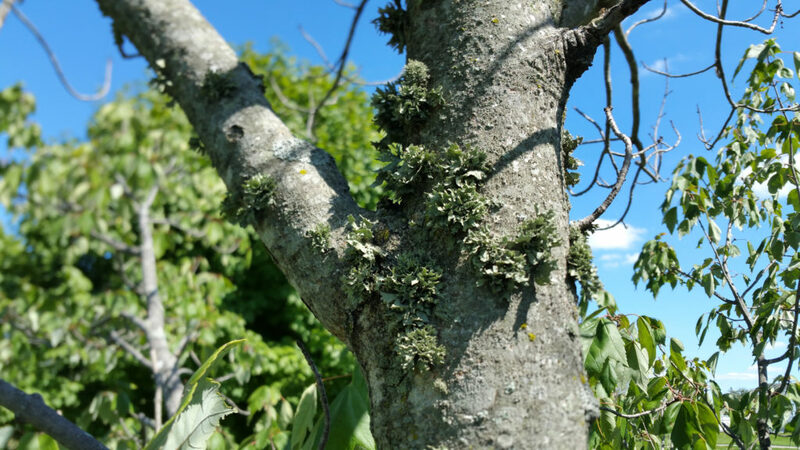 Are LICHENS Bad For Trees? I get asked this A LOT. 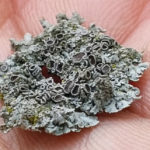 And so, I’ve created this post to offer a brief, but hopefully interesting discussion about the fascinating natural phenomena known as LICHENS (pronounced: “lye-kens”). More field photos below and you’ll find links to additional information near the bottom of this page. 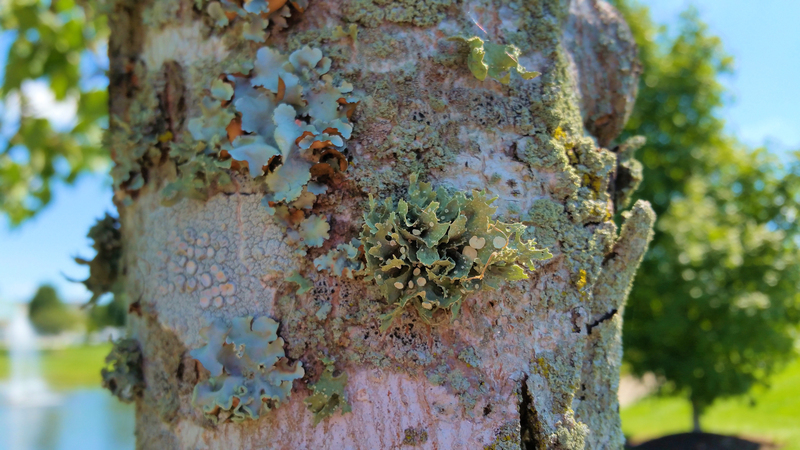 But let’s first address the question concerning ARE LICHENS BAD FOR TREES? …they have not been shown to pose any significant harm to trees. Now you may breathe a sigh of relief! 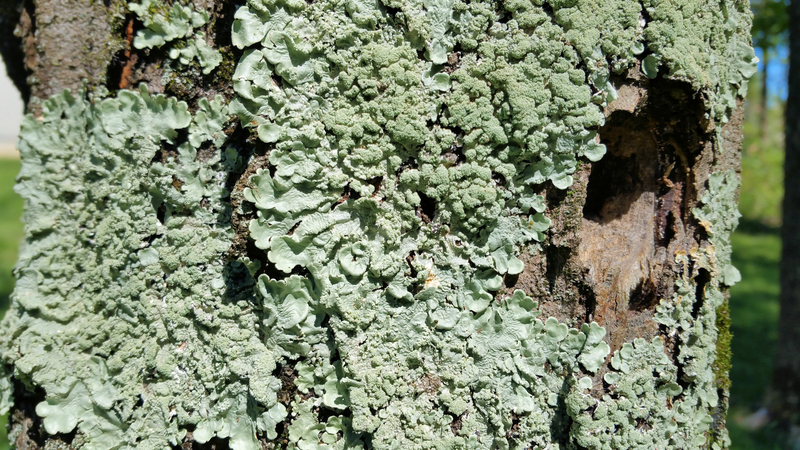 Lichens are greenish, sometimes lettucy-looking, symbiotic growths made of fungi, yeast, and two types of algae. These grow as an interwoven mass appearing as a single individual which can develop into a sizeable “community” of lichens. Both the fungus and the alga provide something essential to the other for their survival but are not harmful to plants. Watering Trees – How Much? and do it in a way that doesn’t discourage you from doing it. 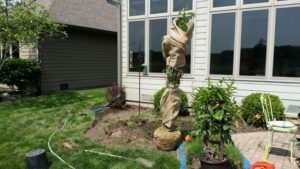 In this post, I hope to provide you access to some good watering tips that may make irrigating your trees easier and less inconvenient to do when you do it. Keep in mind that watering trees is based on each tree’s needs and not necessarily on a schedule. What does that mean? Well, if you have an in-ground irrigation system, chances are it is programmed to water your lawn/landscape at specific times or intervals. Have you ever driven through a neighborhood when it was raining outside and saw someone’s irrigation system sprinkling the lawn? Yep. That’s watering on a schedule and not on needs. 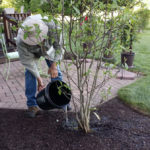 So, you will have to physically go out into your landscape (or persuade/hire someone else to do it) to check the soil moisture of your most valued plantings, if you are interested in the best care for them. Have you ever gone to a tree nursery and to your glee found what you thought to be the PERFECT tree for your home? Maybe you first saw it in a magazine, on TV or the Internet or you caught it on sale at Walmart. Wherever you saw it, you respond out of impulse and purchase it for your property. In no time, you have it in the ground and your taking selfies with it to brag to all of your friends on social media! Poor root establishment because when it was planted it was not checked for encircling or girdling roots, etc. What Does a Tree Think of Pruning? Guiding young and medium-aged trees to develop good branch architecture is key to sustainable tree plantings. The most common method of training and developing healthy growth is by means of proper pruning. But, have you ever wondered how pruning affects a tree? It’s not merely the removal of a broken or diseased or undesirable limb. 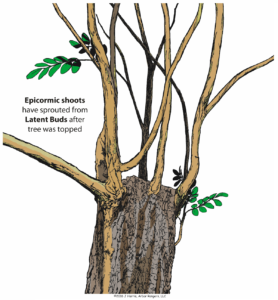 Pruning not only changes a tree’s physical structure, for better or worse, but it also undergoes biological effects, which can have long-lasting affects on its future growth and development. Who knew, right? We prune trees to remove broken or diseased or undesirable limbs, but have you ever wondered, “What do tree think?” Can pruning affect a tree biologically? What affect could Jeff’s pruning this tree (pictured above) have on its future growth and development? To learn more on how proper (or improper) pruning can impact your trees and when is the best time to prune, read the new publication: “Tree Pruning: What Do Trees Think?” (FNR-534-W Feburay 2017) by Lindsey Purcell (Urban Forestry Specialist, Purdue University). 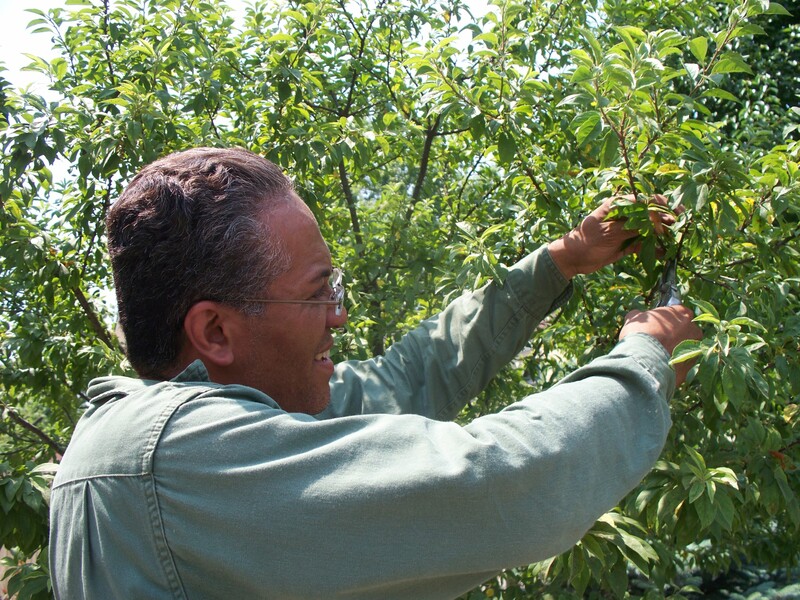 Have you ever wondered, “What is the proper way to plant a tree?” Does it really matter? Sometimes, it’s hard to imagine the future of a tree, like how tall it will grow or how wide. It’s kind of like buying a cute little puppy. It’s small and doesn’t take up much room and, did we mention it’s cute?!! But then after a couple of years it becomes a larger dog that eats more, poops more, and takes up more space. You still love your dog, but over time you come to realize that to really love your pet, you need to do more things to keep it happy, well-fed, healthy and comfortable. The same is almost true with your trees! So how do you keep your trees “happy, well-fed, healthy and comfortable,” especially if you are thinking about planting one (or more)? 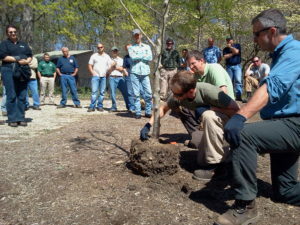 Keep Indianapolis Beautiful (KIB) team demonstrates the latest techniques in tree planting. ​The Indiana Department of Education has announced the following STEM Certified Schools which underwent a rigorous application and review process in order to be awarded. While these are some of the first, other schools will be able to build on their accomplishments. Congratulations! Congratulations to the following schools for achieving a Full STEM Certified Program (School within a School Model)! Want To Learn More About Getting Your School STEM Certified? Review the online webinar HERE. 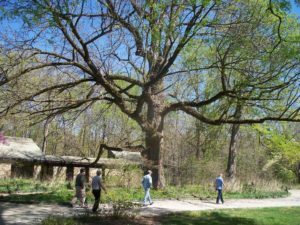 A special invitation has been extended to participate in a project to bring more trees and other greenery into Carmel’s urban forest, reduce hardscape, and help create future generations of tree planters and environmental stewards. As a key first step in creating this nature-rich learning environment, a two-hour design consultation will be held on December 28 & 29, 2016. Representatives from urban forest organizations are invited to attend on those days and offer their expertise. If you are unfamiliar with the Nature Explore program, you are encouraged to view their introductory video at http://youtu.be/Ptxhw8e4l3o. Nature Explore’s landscape architect/educator design team, together with the program’s stakeholders, will design an effective learning environment for the children. Copyright Arbor Rangers, LLC © 2019. All Rights Reserved.